I went to hear Gabrielle Hamilton speak in downtown San Francisco Friday night. Now there’s a lot one can say about her book Blood, Bones and Butter — about what’s in the book and about what’s so clearly not in the book. About her difficult personal life, family dynamics, and road to becoming a chef. But what I’m always intrigued with when it comes to Hamilton are her thoughts on work and accepting, in a fierce and even deliberate manner, what it is you want to do. Regardless of what critics may have said, this is why I kind of dig her. I love them both. I particularly rely on how they act as antidotes and complements to each other. It’s nice to dedicate yourself to writing and the larger thoughts that writing requires after you’ve spent 12 solid hours trying to sort out how many oysters you need for a party and where am I going to get the lavender for that event…you know, cooking preoccupies you with many little mundane things. The writing is an antidote to that. Equally, when you’re searching out one of those elusive things in writing…your sentences are dead on the page, you can’t express than thought…it can be very nice to just get on the line, grill the fish and send it out. It’s so practical and accomplishable and clean and simple. I thought about this paragraph for a while. It’s true that baking pies each week doesn’t require a whole lot of thought. In fact, in many ways it’s routine and even rote. Cut butter into flour, prep fruits and nuts, roll out the dough, crimp the edges. Repeat. But then you see sheet trays of golden brown and bubbling pies come out of the oven–a completed task–and you go home. Maybe you go on a run, make some dinner, do something other than bake a pie because you’re done baking pies for the night. Kitchen work has that ‘pump it out and get it done’ thing going on. Writing, on the other hand, is more thoughtful, stimulating, and intellectually challenging. It feeds the mind in a way that baking does not. But I’ll tell you one thing: you rarely ‘pump it out and get it done’ with writing. Writing doesn’t take a day off. Writing moves quietly into your apartment, your shower, your closet, your garage. Even your car. Writing sits right down at your kitchen table and doesn’t budge. Writing is relentless in this way. And that’s why I need it, too. Later in the same interview, Hamilton speaks about stumbling upon her career path: This is just where I ended up. I have some sliver of talent, so it’s nice to do what you’re good at. And I do like the work of cooking very much. It’s engaging and honest work, and it feels healthy and good at the end of the day. It’s true that not everyone chooses what they do for work. Some people fall into it, some people are shoved into it. Others simply need to pay their bills and found something close to home. But I think regardless, it’s important to have something that you feel good at– however large or small. And something that engages your mind in different ways. Whether it’s a routine that you do over and over and find comfort in or an ever-dynamic task that challenges and ignites you. Or I think, ideally, some combination of the two. 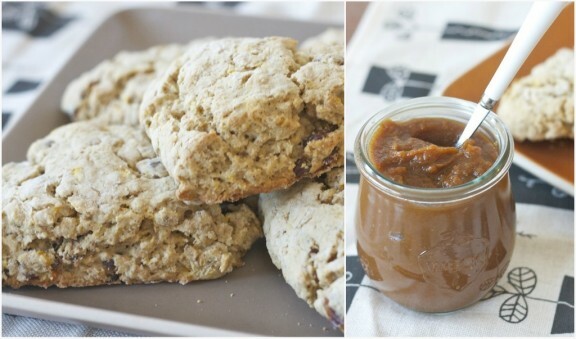 And as far as combinations and pairs and perfect marriages go, crumbly scones and lightly spiced pumpkin butter are pretty high up there on my list. These scones are inspired by Marion Cunningham’s Oatmeal Raisin Scone recipe in The Breakfast Book although I’ve ultimately used less sugar and whole-grain flours here. Also, when Sam was last in town, he picked up a little container of dates at a Middle Eastern grocery (Persian, Sam says) in downtown Berkeley. I’ve been wanting to bake with them ever since, so these scones morphed into Oatmeal Date Scones with a little orange zest and nutmeg for warmth — the perfect vehicle for a dollop of homemade pumpkin butter. If you’ve yet to use oat flour, it has a really nice, mild sweetness that works well with muffin and scone recipes. And I love working with King Arthur’s white whole-wheat flour. To use it for the entire recipe would result in a clunkier scone, but the percentage of whole-grain flours here is pretty close to perfect. The trick is to work quickly so as not to let the butter get to warm. Also, you may find the dough to be a little on the wet side; that’s o.k. Use flour liberally when you’re shaping and cutting them and you’ll be just fine. Since it’s just me in my apartment, I froze these scones and have been quickly heating them in the stove each morning. They freeze beautifully. Preheat the oven to 375 F. In a medium-sized bowl, quickly whisk together the flour, sugar, baking powder, baking soda and salt. Add the cubed butter and, using your hands or a pastry cutter, rub or cut the butter into the flour mixture until it resembles small, course peas. Do this quickly so the butter won’t warm too much. It’s o.k. to have a few larger chunks of butter. Add the oats, dates, orange zest and nutmeg and stir with a fork to combine. Add the buttermilk and stir until the dough gathers together in an uneven ball (I use my hands at this point). Take out a large wooden board (or use a clean table surface) and sprinkle generously with flour. 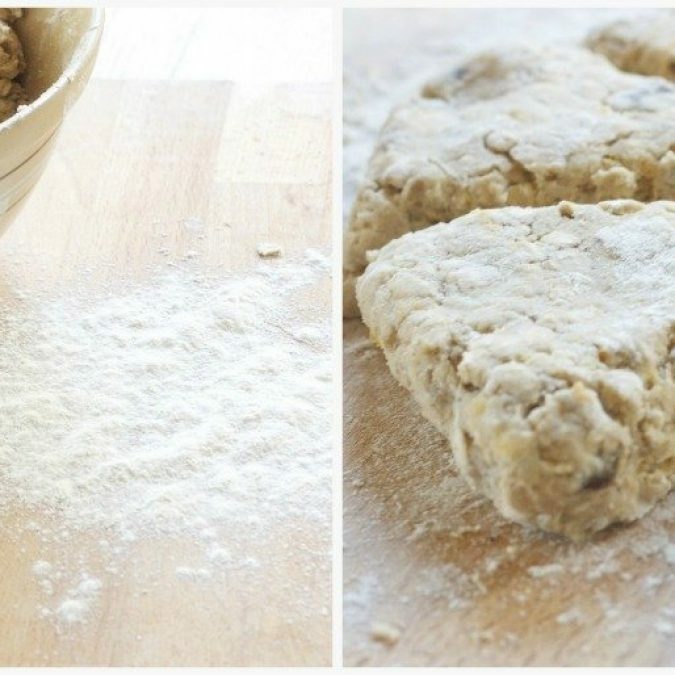 Dump out the dough onto the board and roll around in the flour to coat the exterior. Quickly gather the dough into a ball and pat/push it down so it’s circular in shape and about 1/2-inch thick. Cut into 6 or 8 wedges depending on how large you like your scones. Place the wedges on an ungreased baking sheet and bake for 20-25 minutes, or until lightly brown. Combine all of the ingredients into a small saucepan and bring to a slow boil. Reduce the heat to a simmer and stir the mixture often to ensure it doesn’t stick or burn. After about 20-25 minutes, the mixture will darken in color and thicken–it’s ready! Now you can transfer it to nice glass jars and refrigerate for 10-12 days. And maybe that's why I like to chop onions and cook dinner at the end of the writing day. Those are things I know I'm good at. The rest is necessary compulsion. Cooking, writing, and parenting also seem to blend together nicely. In parenting I feel out of control and completely lost at times. In the kitchen I am most confident - me. It fuels me for the role of being a mom. Writing forces me to have thoughts deeper than, "pick up those toys", "please stop screaming", "stop jumping on the couch!". I love the idea of deliberate and fierce acceptance of what you want in life - that's exactly what I'm working on right now. I think the hardest place to start is opening yourself up to questions - questions of whether you're doing what you want to be doing, questions of risk and change and transition, questions of what kind of balance you want in your life. Once that gate opens, it's pretty hard to look back. More and more I think people are finding they want to make a life that might seem unconventional, but if they accept what they need and defend their vision, they're infinitely closer to making it a reality! I may bake these scones today. I have dates and was wondering what to do with them. This will be perfect! oh I love this, megan. In a phase where I HAVE to sit down and right, all I want to do is cook (and not be taking notes about it!). Both of them have their freedoms and shackles, don't they? I would love to hear Gabrielle speak, I've only read a few interviews of hers and she sounds so interesting. Wonderful post. Your post has touched a place that is dear to me. I am making a more structured effort to stop my frenzied kitchen activities and write very day. I need to balance cooking, photos and the introspection of writing. Thank you for sharing such a thoughtful post. I love Gabrielle's ability to read herself. I write fiction writer and makes my living by cooking, but I prefer to temper my writing with baking. There is nothing more soothing than stirring batter with a wooden spoon and knowing that your cake will rise and taste delicious at a time when you're feeling suspicious about the writing process. I return to my pad and paper feeling more open and trusting when I've accomplished something straightforward. Then the next problem-who is going to eat that cake? i think some of my best writing comes to me in the shower. or when i'm supposed to be writing something else. i like this post, megan. have a lovely week! Sarah: You're so right about being to return to writing after accomplishing something straight-forward. Yes. Sara:You have every excuse to "lose it." Hang in there, friend. Deb: Fall is the best time to balance those things, I think. Christa: Thanks! You'll like them; they're super easy (actually the pumpkin butter you could basically do in your sleep--and it's good on ice cream, too). I know I basically say the same thing after every post but I mean it. Another beautiful post, Megan - every word is perfect. MC's Breakfast Book is my favorite cookbook and I can't wait to try your adaption. Oh thanks so much, Mary. Yes that book just wins every time! Sometimes I feel I've been falling, or perhaps flying by the seat of my pants, my entire life. I'm always intrigued by process and how people move through their lives and arrive in certain places. I don't think at, let's say 20 years old, I would have ever guessed I'd be where I am today. Life is full of surprises. My experience is that it often makes sense in retrospect, but rarely in the moment. Happy baking and writing. Loved this post! Absolutely beautiful. I struggle to find time to write because I'm so often busy working my job that pays all the bills. But it's true that writing never leaves me; it's all I want to do all the time, so I'm constantly thinking of things while driving and showering etc. Thanks for sharing! I love this & it's so true about writing and how it just hangs on and head butts you or sometimes just whisps by out of grasp. 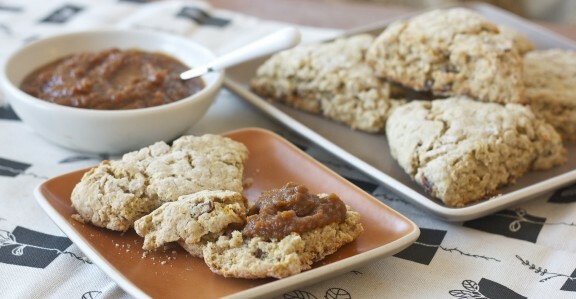 The scones and the pumpkin butter look amazing and I think I'll make this next weekend. Dates and oats are already a favourite combination of mine ad with pumpkin butter? Fab. Your writing is so beautiful - I feel bad to be only catching up on some of your recent posts now. I always feel calm after I visit your blog, your words are soothing and comforting. I love the comparison you make here between writing and cooking also. You are so lucky you do both for a living - not only are you amazing at both but your passion shines through. I totally agree with you about feeling good at your job. I've gone through so many professional ups and downs in the past year and it's hard to find something that feels fulfilling AND pays the bills. The ability to both, whether it's the same job or you have something you do for income and something, like blogging, that you do because you love. Oh... these look so good!